If a play includes the BBC, lesbians and emotional instability within the arts, it would be fair to assume it’s a contemporary text. The Killing of Sister George, written in 1964 by Frank Marcus, is refreshingly ahead of its time and despite its age, doesn’t feel particularly dated. 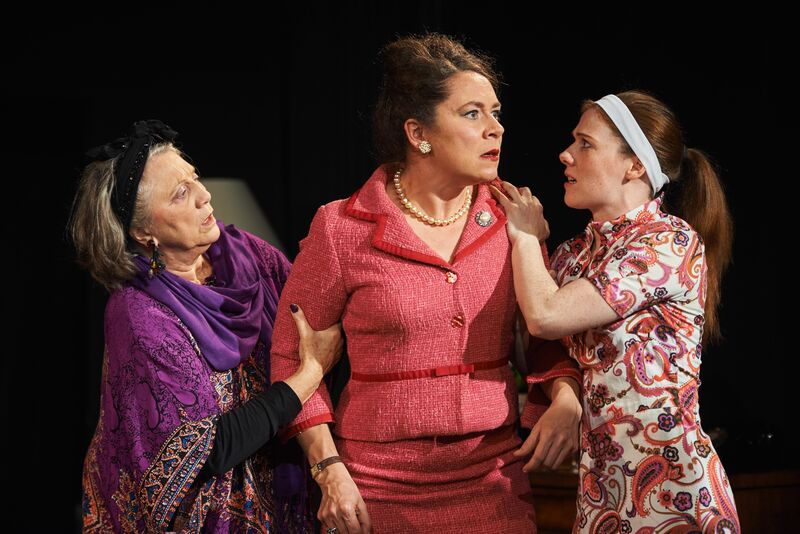 In an excellent production by Artful Theatre, this all-female four hander kills off a beloved radio drama character to look at the difference between public perception and actual reality. The cast of characters is a vibrantly coloured one. June Buckridge (Sioned Jones) has played Sister George on the popular radio drama “Applehurst” for over six years. Over that time, she’s lived with her “flatmate,” Alice “Childie” McNaught (Bryony Rawle) who she emotionally manipulates and abuses. Sister George is lovely and virtuous, June is anything but. Jones captures the blur between actor and long-embodied character exquisitely, embodying June’s aggression that covers her fragility. Sarah Shelton is Mrs. Mercy Croft, the BBC’s assistant executive head who is tasked with breaking bad news to June. Initially cold and businesslike, she warms to Rawle’s vulnerable Childie. Rounding off the cast is Janet Amsden as the eccentric clairvoyant Madame Xenia who lives upstairs, a woman who adds some much needed levity and stability. Marcus would have done well to include more of Madame Xenia, as even though there is plenty of comedy written into the script, the story is a dark one indeed. The four women fill the intimate venue with energy so it’s fit to burst. Despite mentions of telegrams and conspicuously absent mobile phones and computers now vital to working professionals, the play feels modern due to themes that are still relevant. June and Sister George could not be more different, and the public adore Sister George; June doesn’t cope well under the immense pressure of living up to the ideals belonging to someone imaginary. June’s work-life balance is disturbed when Mrs Croft visits her home for meetings, a feeling actors know all to well what with the amount of admin and line learning that happen at home. There is also the implication that these women have no one else in the world that’s a friend or family. Of course there are work colleagues, clients, and fellow cast members, but there’s a desperation and heavy loneliness that hangs over these four. I hadn’t been to London Theatre Workshop before, or seen a production of the quintessentially English The Killing of Sister George, and was impressed by both. A well-looked after gastro pub theatre space and a new-to-me play that could easily come across as stuffy and old fashioned is instead filled with life.